Mama Duck: What do you feel your specialty is? Ryan: Petal isn't defined by a "style" but rather by a willingness to absorb the details of our environment, respect the individuality of each flower, and combine what we discover into new and unexpected creations. Each project is an opportunity to create something new and exciting. 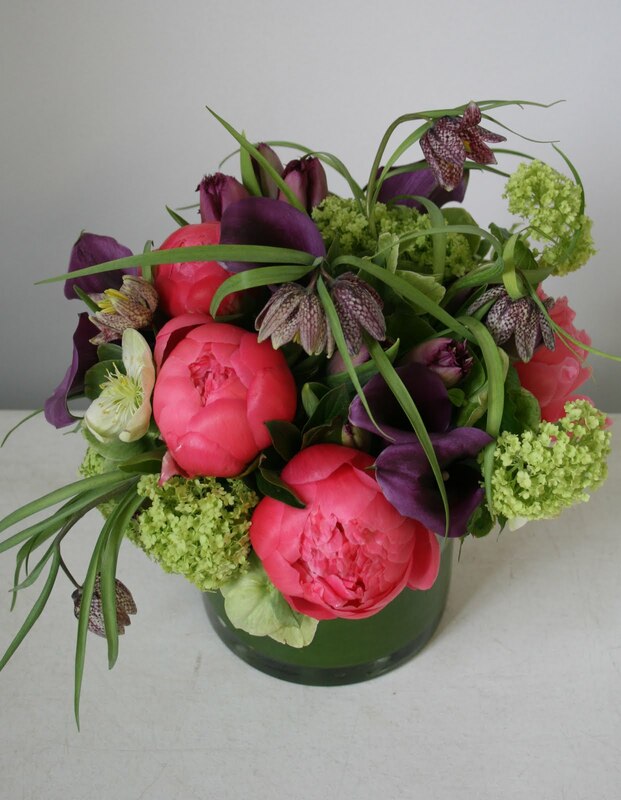 Mama Duck: What are your favorite color combinations? Ryan: Can't decide on a color palate for your big day? You're not alone! We recently did a wedding for a bride who had no idea of what she wanted her color scheme to be. She wasn't sure if she should stick with her own favorite colors, the colors of the season or the colors of the venue. It can be overwhelming but that's where your event designer comes in! After flipping through our portfolio, she was able to point out colors and specific flowers that she was naturally attracted to. We were able to combine one of her favorite colors with something seasonal that worked beautifully in the space. 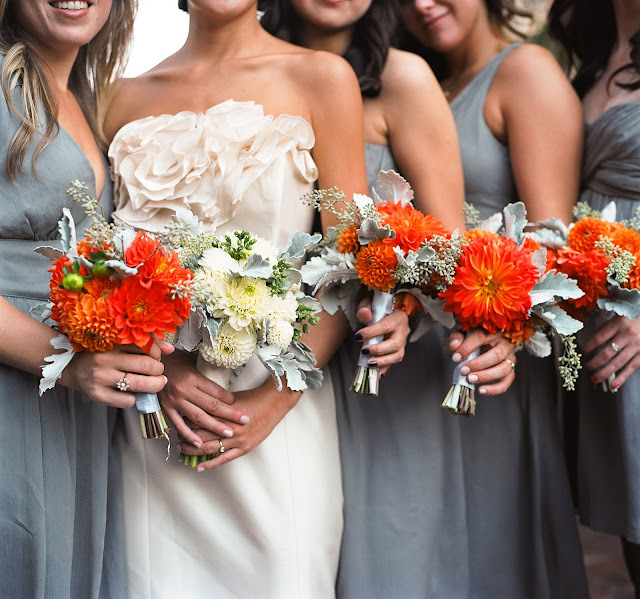 It also turned out to be one of our favorite color combinations: Orange & Grey. Want a nice play of light/dark? Try coral and eggplant together! We know what you're thinking: "What?! I don't think so. That just sounds ridiculous!" But you couldn't be more wrong. This color combination is both fun and dramatic. At first glance you notice the beautiful coral. Then your eye starts to move to the deep eggplant. This bold color combo has quickly become one of our favorite summer picks! 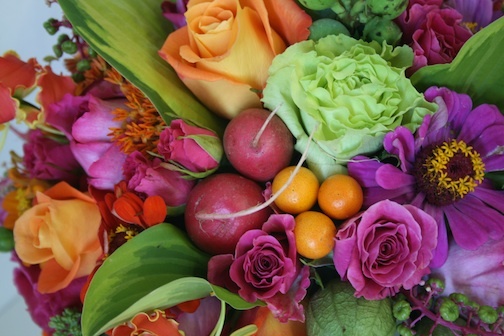 Mama Duck: What are your favorite non-floral items to incorporate into your work (for example, artichokes, lemons, etc.)? Ryan: There's nothing more fun than finding an artichoke or a lemon in your centerpiece! The bottom line is that non-florals like limes and pomegranates are not only perfect for adding a unique punch, but they can also be a money saver (insert cheers from brides here)! 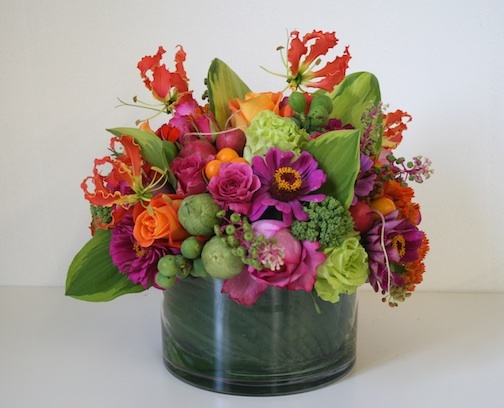 We had a client who wanted a colorful "congrats on your engagement" arrangement for a friend. Our client wanted to be sure that it looked "festive" and asked if we could somehow put sparklers and glitter in the arrangement. Sparklers and glitter aren't really our thing (plus we didn't want to have to send the arrangement with a fire retardant blanket), so we decided to let the flowers speak for themselves. We made sure to use a wide range of colors to really give it that festive look while using sparkler-shaped flowers to give it more movement. We love incorporating unexpected market produce, especially when it comes to kumquats, tomatillos and radishes (oh, my!). Mama Duck: If you were to do the florals for the past two "Love the Look, Steal the Style" columns, Freeman's (click here for the post) & Imperial No. 9 (found here), what would you suggest? Ryan: Imperial No. 9: The thing that's most important about this look is having the ability to bring the outdoors in in a sophisticated manner. 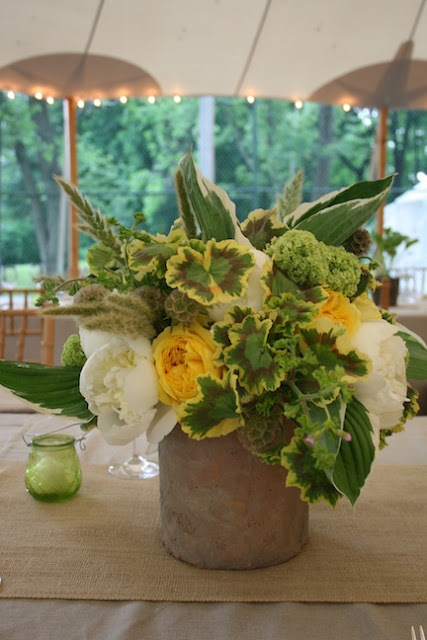 For a lovely summer wedding with an outdoor feel, try using burlap runners. I LOVE me some burlap! Since most venues provide linens (white, ivory), adding a simple burlap runner is inexpensive and adds texture to the table. Try mixing eclectic containers in natural woods and aged ceramics. 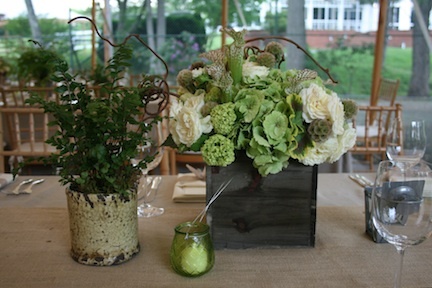 Fill some containers with woodsy floral arrangements and use the others for ferns and mosses. Freeman's: The look of Freeman's is so fun! It almost made me want to go hunting. 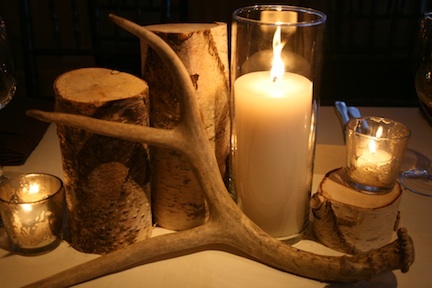 Another option for this "feel" is to use birch stump clusters as centerpieces with naturally shed deer antlers. And to give it a little glisten? Use silver mercury glass votives. Table numbers are also a great way to incorporate more interest and your family and friends will love you/be jealous of you for thinking about such details! 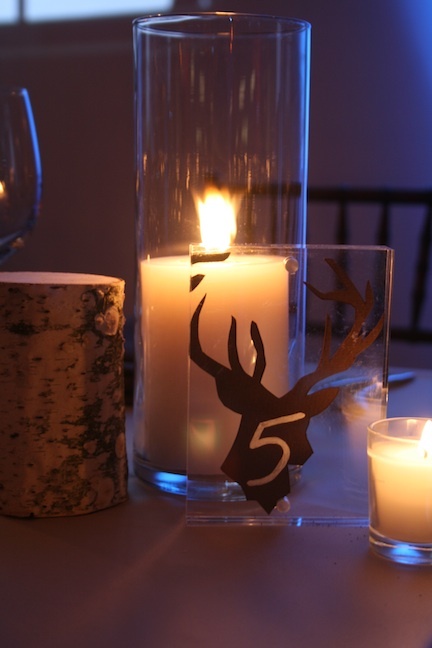 Editor's note: Ryan made these table numbers. So crafty!